To celebrate, HRT’s Traffix Program is hosting events during Bike to Work Week in Hampton Roads. Learn the benefits of traveling by bike, and how simple it is to pair public transit with your bike. 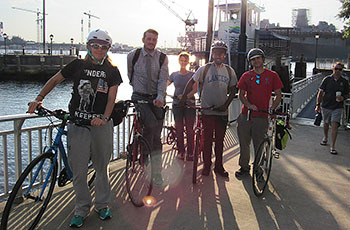 For instance, did you know you can take your bike on HRT’s light rail service The Tide and on the Elizabeth River Ferry? Or that there are bike racks on the front of HRT buses? Tuesday, May 16 Newport News Transit Center, Newport News 5 – 9 a.m.
Wednesday, May 17 Silverleaf Commuter Center, Virginia Beach 5 – 9 a.m.
Friday, May 19 Bike with the Mayor, Virginia Beach 8 – 9 a.m.
Friday, May 19 Portsmouth Lunch Bike Ride, Portsmouth 12 – 2 p.m.
Friday, May 19 High Street Ferry Dock, Portsmouth 7 – 9 a.m.
Friday, May 19 MacArthur Square Station, Norfolk 7 – 9 a.m.
All events are free and open to the public. Learn more at gotraffix.com/bike.